Restrict Content Pro can be easily translated into any language and even includes several non-English translations. If your language is not included in the list below, or your language has an incomplete translation, follow the instructions below to create and/or update a translation so that Restrict Content Pro may be used wholly in your desired language. Note: some translations may be incomplete. New translations can be easily created for Restrict Content Pro at anytime by writing a translation file. 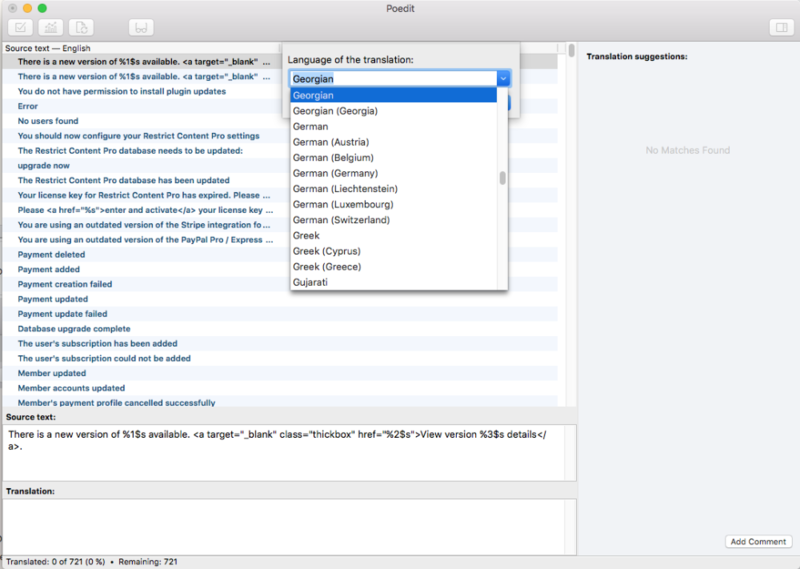 There are numerous ways to create a translation file, but the easiest is through a free application called POEdit. If you have a tool you prefer to use, use that, otherwise download POEdit for free and open it. 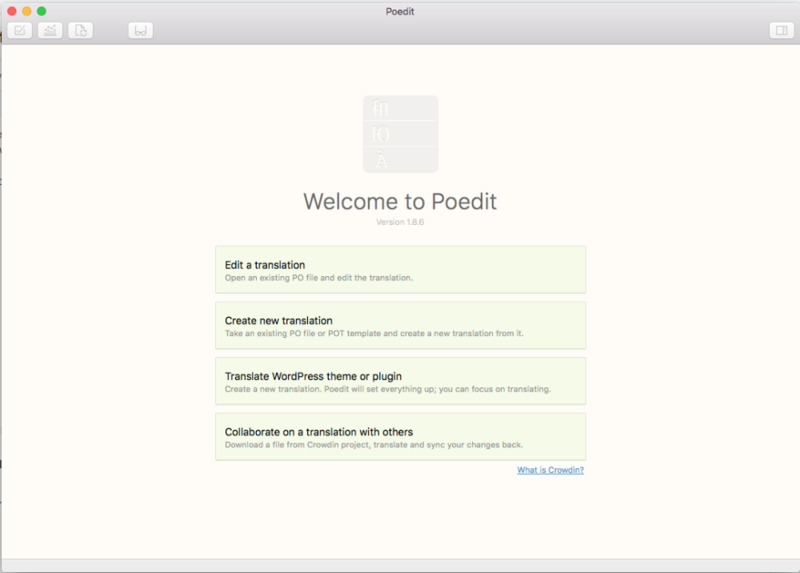 POEdit will ask you whether you wish to edit an existing translation or create a new one. Click Create new translation. This will open a file select dialog. 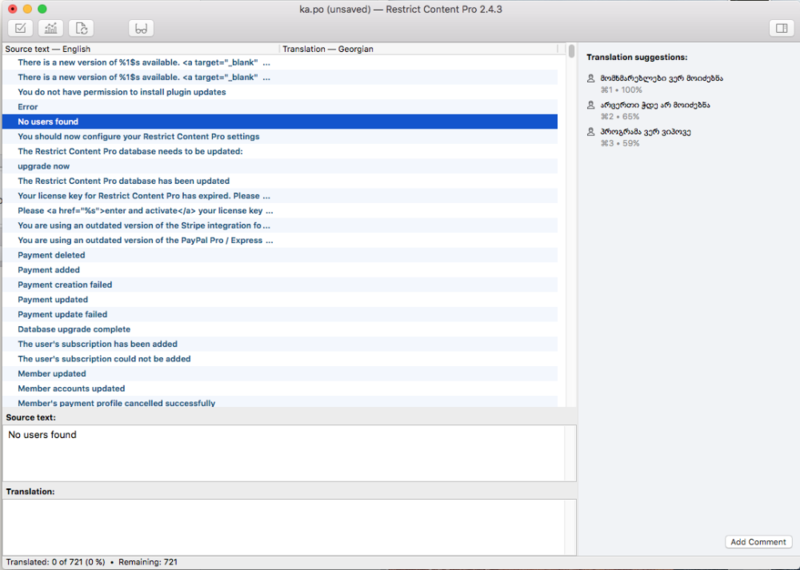 Navigate to where you have downloaded Restrict Content Pro and select the rcp.pot file inside of the languages folder. 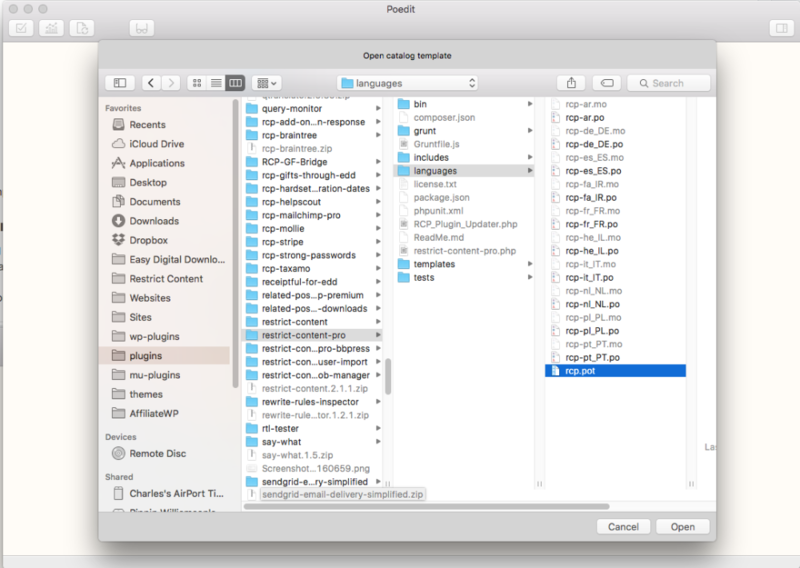 Restrict Content Pro supports two different locations for translation files. Place these two files inside of one of the above folders and Restrict Content Pro will automatically detect them and display the plugin in the appropriate language based on your WordPress settings. If Restrict Content Pro already has a translation for your language but it is incomplete or needs improvements, you may update it at anytime using the same steps as above with just a few minor differences. If you have translated Restrict Content Pro into another language, or made improvements to an existing translation, we would love for you to send us the translation files so we can include them in the plugin. Simply send us an email from the support page and attach the translation files.